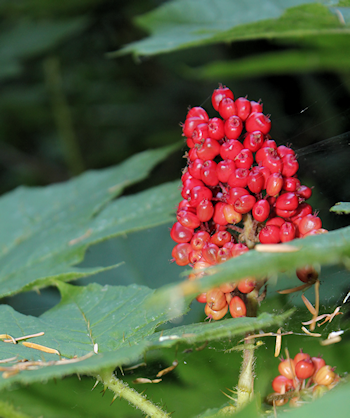 Devil’s club or devil’s walk­ing stick is a large shrub native to the cool moist conifer forests. It is found from Alaska to west­ern Ore­gon and east­ward to west­ern Alberta and Montana. Devil’s club usu­ally grows in moist, dense for­est habi­tats, and is most abun­dant in old growth conifer forests. This native shrub always catches my eye in the late sum­mer. Those clus­ters of showy red berries remind me of Christ­mas. I’ve found devil’s club along shaded streams around Salem and high up in the Cas­cades above Pamilia Lake and in many places in between. If it didn’t require moist, cool con­di­tions, I’d be tempted to try to grow Devil’s club in my garden. Devil’s club gen­er­ally grows up to about 5 ft tall but I’ve seen it reach more than 10 of 15 feet tall in old growth forests above Detroit Lake. The large palmate leaves are about the size and shape of my out­stretched hand and the lower veins and stems are clad in spines. I’ve never tested them, but the guides say the spines are brit­tle and break off easily. The dense spines, height and the way the leaves grow almost par­al­lel to the ground give the entire plant an almost “pri­mor­dial” appearance. The plants are slow grow­ing and take many years to reach seed bear­ing maturity. Native Amer­i­cans used the plant both as food and med­i­cine. The plant was tra­di­tion­ally used by Native Amer­i­cans to make paints, and to treat a vari­ety of tumors. The plant is har­vested and used in a vari­ety of ways, includ­ing lip balms, oint­ments, and herbal teas. Unfor­tu­nately, devil’s club is slow grow­ing and there­fore sen­si­tive to human dis­tur­bance. It may take years to recover so be gen­tle with devil’s club if you come across it on your next outing.